The last time I visited Snowdonia was in November 2012. I stayed in a B&B for a few days with the hope of being outdoors as much as possible. Unfortunately from the moment I arrived in Llanberis the sky clouded over so I had to make the best of dull autumn light. I barely saw the peaks of the mountains that were the subjects I most wanted to photograph. Since that trip I’d felt a strong desire to return. 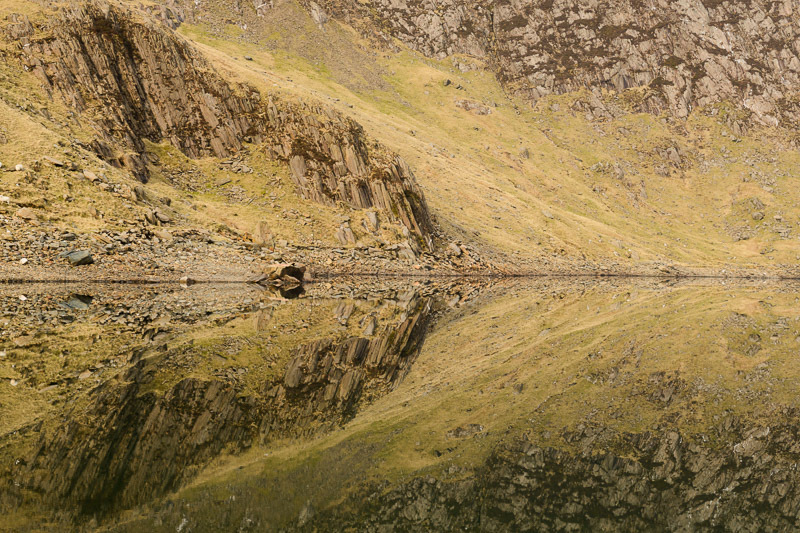 In May this year I found a suitable week to return to Snowdonia. I would have four days in which to make pictures and if the weather was suitable I planned to camp at Llyn Caseg-fraith and hike to Glyder Fach and Glyder Fawr. Thankfully the weather forecast turned from grey cloud to sunny just before I was due to leave. What followed was four days of superb sunshine; the complete antithesis to my previous trip. 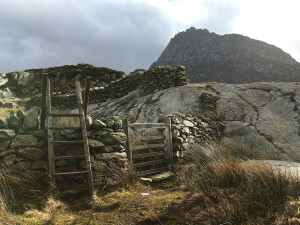 One of the first A frame stiles on the route with Tryfan looming behind. Arriving late afternoon on the first day, I parked at the foot of Tryfan and made my way along the Miners’ path up to the Glyderau mountains. Every time I camp and take my camera I am rudely reminded of how tiring it is. The effort of carrying a heavy backpack up steep slopes is considerable but when combined with late bed times, disturbed sleep and early starts the experience can be exhausting. I reached my camp site of Llyn Caseg-fraith after a couple of hours – a little slower than I’d hoped due to losing the path and having to navigate steep grassy banks. I had two hours to spare before sunset so I quickly pitched my tent by Llyn Caseg-fraith and continued onwards to the peak of Glyder Fach. Knowing little about the peak I didn’t realise it contained a boulder field and that slowed my progress considerably. The last climb to the top is strewn with hundreds of huge rocks which must be scrambled over. I was looking for Castell y Gwynt, an impressive rock formation with a name that translates to “Castle of the Winds”. With little time to spare before dusk I stopped my search and decided to photograph what remained of the sunset and view of the Ogwen Valley. Shortly after getting one or two shots low cloud blew in from the south and visibility dropped, taking the view with it. I clambered back over the boulder field, by this time fed up with navigating at a snail’s pace, and returned to my tent hoping that I would have more luck the following morning. Thankfully my tent was clear of cloud so I was able to make one final picture before bedtime. I’d pitched my tent with this composition in mind. Perhaps a must-do for any mountain photography trip: a glowing tent with a mountain in the background. Following a broken night’s sleep my alarm woke me at 4:30am. The hill fog from the previous evening was still surrounding my tent so I continued sleeping in the hope that it would clear as sunrise neared. I woke every half an hour for the next two or three hours but still the fog lingered. By about 10am I noticed more of a glow through the tent’s lining – the cloud was clearing. Unfortunately by this time the light wasn’t right for any pictures to work so in a disappointed mood I packed up my things. I needed to restock my food supplies and think about my plan for the next evening so I retreated from the mountains to my car. Lunch in the nearby Moel Siabod cafe was very welcome (I recommend it!) and the opportunity to use their wifi meant I could check the forecast. I don’t normally repeat visits to a location during short trips but on this occasion the forecast looked very good and I was determined to get some shots of the Glyders. My camp site for the second night. Hill fog… again. A few hours later I’d driven back to Tryfan and retraced my steps to Glyder Fach, this time camping higher, just before the boulder field. Time seemed to fly until the sun arced through the sky and began to set again. With a much clearer forecast I was able to find Castell y Gwynt easily this time. Despite it being a prominent feature I found it difficult to photograph. There were plenty of pointed rocks to create foreground interest but most jutted out in odd directions or blended together to form a grey, confusing mess in the viewfinder. The light was turning golden and low cloud again started sweeping in from the south, occasionally blocking the view. I started to feel disheartened again. After what must’ve been an hour and a half of head scratching – wandering around Castell y Gwynt looking for the best angle, crouching down and examining the visual relationship between various stones – I settled on a composition. By now the golden light was nearing its most intense and I felt an urgency to get a shot before my opportunity was lost. Within the space of 10 minutes I made two pictures with slightly different compositions. I think I prefer this one as the foreground gives context to the main focal point of Castell y Gwynt without stealing the limelight. Castell y Gwynt looking suitably dramatic as warm light from sunset reaches the peak of Glyder Fach. Purchase this picture as a print. Once the sun had finally gone behind cloud I made my way back to the tent, clambering back over the boulders from earlier, hoping to get back and get sufficient sleep so that I wouldn’t be a zombie when sunrise came around six or so hours later. On the way back to the tent low cloud covered the view of Tryfan so I thought I’d reached the end of my photography for the evening. Suddenly the clouds parted and for three or four minutes I was treated to a view of Tryfan beneath an intense purple sky. I rushed to a spot I’d found earlier but by the time I’d got my camera and tripod ready the view was gone again. I waited for a few more minutes and luckily another break in the cloud revealed Tryfan again. Unfortunately the intense purple hue was gone but the dusk sky was still atmospheric. A view that lasted only a few seconds. Timing was key to getting the composition right. The next morning I woke in time for sunrise. Hill fog again surrounded my tent and covered much of the view towards Tryfan. Setting my alarm for 30 minute intervals, I went back to sleep and eventually woke around an hour later to find that the cloud was slowly lifting. I decided to clamber back up Glyder Fach one final time to photograph Tryfan from the top of Bristly Ridge. Having now clambered over Glyder Fach’s boulders several times in 48 hours I felt quite at home. Moving around was still frustratingly slow but the views were familiar. Post-photography breakfast was most welcome and a short while later I packed my tent and camping things away before making the descent back to the car. My plan for the rest of my time in Snowdonia was much more relaxed. I wanted to visit Anglesey while I was in the area so with the island’s South Stack lighthouse earmarked for sunset I planned what to do for the rest of the day. 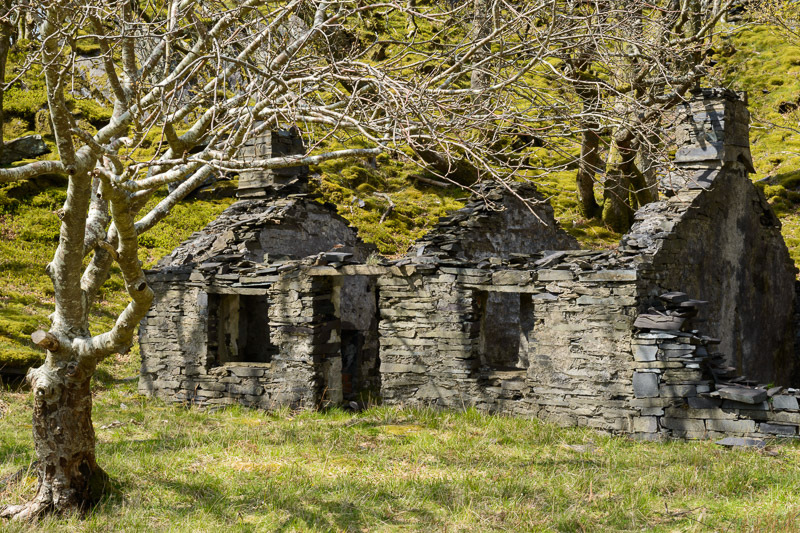 While researching the trip Dinorwic Slate Quarry seemed like an interesting place to visit. The quarry sits on a hillside west of Llanberis and over the years it’s had a big impact on the landscape, carving mountains of slate from it. Now though it’s a quiet place that I guess doesn’t receive a great deal of tourist traffic. Walking along the public footpath that runs through the quarry was wonderful; I admired old warehouses and the rusting remains of pulleys and cables that lie around, punctuated with splashes of green foliage growing here and there. The juxtaposition of masses of grey from the slate with splashes of green from the trees and plants was interesting and a welcome change in scenery from the big landscapes of the last two days. I like photographing derelict places so I was at home. The House Wot Jack Built: made to last (well, apart from the roof and windows). That evening I headed north to Holyhead and South Stack Lighthouse. A text message from my mobile operator welcomed me to Ireland as I reached the car park so I knew I was heading in the right direction. I’d seen pictures of the snaking staircase that leads to South Stack Lighthouse and I wanted to capture that in my picture. I climbed up and down the stairs a few times, checking various viewpoints before I decided that the highest view gave the best perspective. With my camera carefully positioned overlooking the steep drop in front of me I waited for the sun to set so I could make some longer exposures as the tower’s light came on. A colourful sunset ensued and although it was very pretty I decided that I preferred the more subdued colours of dusk with the lighthouse’s light glowing brightly, adding to the mood of the scene. 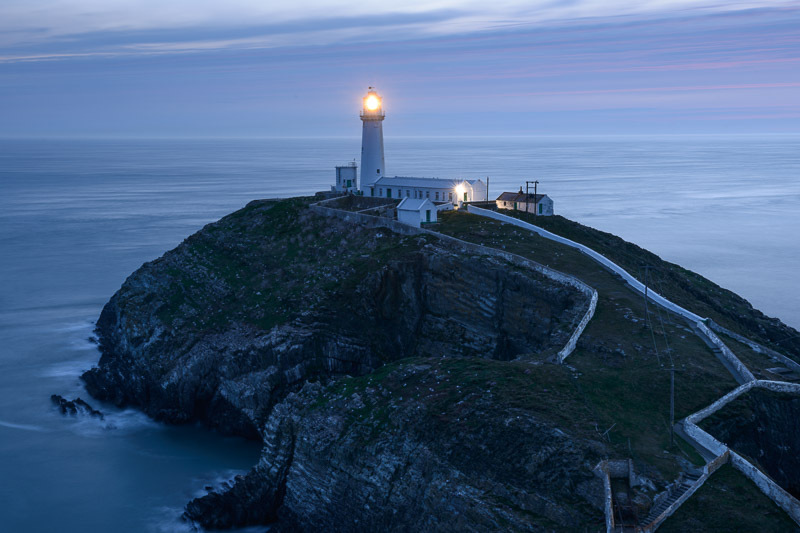 South Stack Lighthouse, Anglesey, illuminated at dusk. My accommodation for the night was a firm bed in Llanberis YHA. I slept like a log and again woke to my pre-dawn alarm. Minutes later I was out of the door and in the car heading for some of Snowdonia’s lakes. Having checked the weather forecast the night before I’d noticed that the wind was due to drop considerably and I hoped this would make for mirror-like reflections on some of the lakes. The sky was fairly cloudy and uninteresting as I drove to my first stop at Llynau Mymbyr. Its water was unfortunately too choppy and the sky too hazy to making a good picture so I turned back and headed for Llyn Llyddaw. 40 minutes later I’d parked my car at Pen-y-Pass and hiked to the llyn. To my delight there was virtually no wind and the lake’s surface acted like a mirror. It was slightly confusing but mesmerising looking around and seeing everything in double. With the light still quite flat I concentrated on close-up abstracts of the landscape reflected in the water. Of the handful of pictures I made I was most pleased with this shot depicting a rocky outcrop that formed an arrow shape when reflected in the water. Magic eye: stare at this long enough and you’ll see a Unicorn eating a strawberry Cornetto. I promise. After enjoying the stillness of the air and the view of Snowdon for a while I headed back to the car for the last time. As I arrived there walkers were donning their boots to start their journeys up Snowdon via various routes. A few minutes later I was making my own journey home to the south, having enjoyed my time in the company of some great mountains. It’s funny how short memories can be: shortly after this trip I felt I didn’t want to return to the mountains for some time but right now I’d love to go back. This lone rock above the Ogwen Valley was crying out to be stood on. In fact I think it was purposely put there for selfies. Could not find the unicorn or the strawberry he is allegedly eating, but I enjoyed your beautiful photos nonetheless!